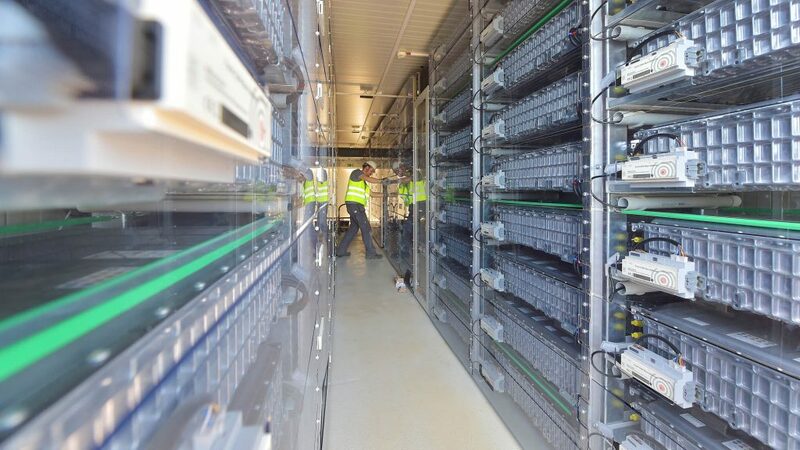 Kolitzheim/Dresden (Germany), Slough (UK) – BELECTRIC, the global PV and battery storage specialist, has recently commissioned three new large scale battery storage facilities based on first and second life automotive battery modules from different manufacturers. The facilities are providing frequency response and related system services. BELECTRIC has designed, built, and commissioned the new storage systems with a total capacity of more than 40 MW on behalf of well-known utility and automotive customers. The latest of the three new battery storage facilities has a capacity of around 22 MW and was recently commissioned in Wales, UK. The battery storage is tied into an existing wind farm and provides frequency services to National Grid under an Enhanced Frequency Response contract for four years. The second new system was built on the premises of a large-scale car manufacturing plant in Germany, utilising the battery modules that also power electric and hybrid vehicles assembled at the same plant. The battery storage system with a capacity of roughly 14 MW will provide frequency response services and support the local grid. In Germany BELECTRIC commissioned another storage system based on automotive batteries. The storage with a capacity of roughly 7 MW enhances the operational capabilities of an existing power station, and also provides frequency response services to the European electricity grid. The new projects thereby tap into similar revenue streams as the systems built with battery modules for stationary applications that BELECTRIC has been involved in as EPC and O&M provider. BELECTRIC has realised battery storage projects based on different technologies with a total capacity of 100 MW and provides operation and maintenance services for these plants. BELECTRIC has been building battery and hybrid systems since 2013 in Europe, America, and Africa. In this time, BELECTRIC has gained unrivalled experience in utilising different battery technologies. Initially, systems were based on lead-acid technology. Due to the rapid price decline, the majority of systems are now based on lithium-ion technology, using both stationary and automotive battery modules. For systems up to 20 MWh, BELECTRIC usually tailors the container layout to the specific requirements of the battery modules in its production facilities in Germany. BELECTRIC has also commissioned systems using dedicated battery housing units, which have proven to be more economical for larger projects.